You know that moment when summer officially hits and you go to the beach and you get a tear in your eye sand in your eye when you try to crack open your favorite beach read? Yeah. All you can do is blinkblinkblink and try to convince everyone you weren't crying overwhelmed by allergies. When was the last time you've found and read a book you truly wanted to marry could not put down? For me, that book was SHATTER ME by Tahereh Mafi. Since today is my birthday, I'd like to give a gift to all of you. 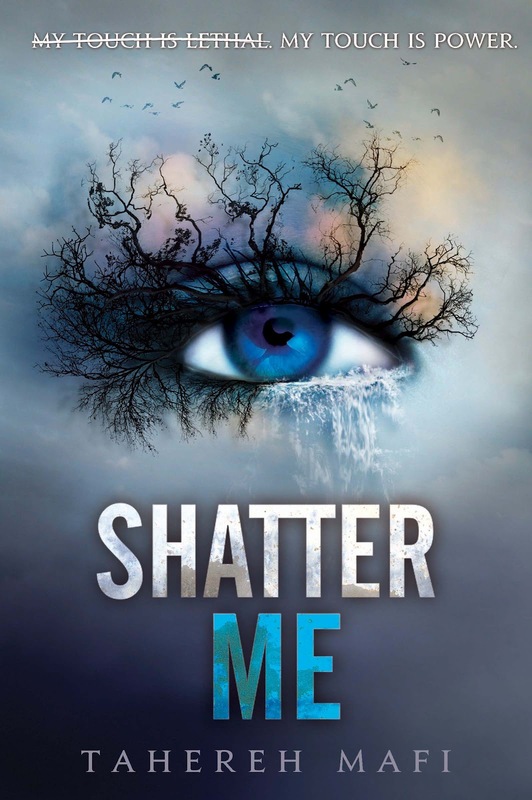 Below, you'll find the rafflecopter entry form for a hardcover copy of SHATTER ME. This is the original cover. This is not the paperback of the new style/covers that were revealed recently on MTV's Hollywood Crush. This is the new cover for the paperback. I've got it featured on the sidebar, so blink twice (if you're seeing double) and click the link to preorder. It reminded me of the special eyelashes Effie Trinket wore in THE HUNGER GAMES movie. I love all the details, including the one hidden in the iris of the eye. I also like how they link to the DESTROY ME cover which is like SHATTER ME 1.5, from Warner's perspective!! I cannot wait to read this. Seriously. Cannot. Wait. 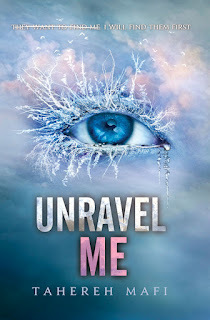 And then there's the cherry on top jewel in the crown of these covers (so far)--UNRAVEL ME. I say that because I'm counting on Tahereh to write another "inbetween" story that lands somewhere between UNRAVEL ME and the final NAME ME book of the trilogy. I also say that, because I really love the first two covers as well. There's too much shiny all the things to stare at. I did ask Tahereh to answer a few interview questions, but unfortunately, she's been on tour a TON recently, and just got back from South America. If she's able to answer my questions, I'll definitely post them here for you to see. Also, Tahereh is a HOOT to follow, so be sure to follow her everywhere she lurks! She has a great blog called, GRAB A PEN, and can usually be found lurking on Twitter, Facebook and Tumblr. You should totally stalk her like a creeper engage in an ontological dialogue about Team Warner or Team Adam. Or cake. 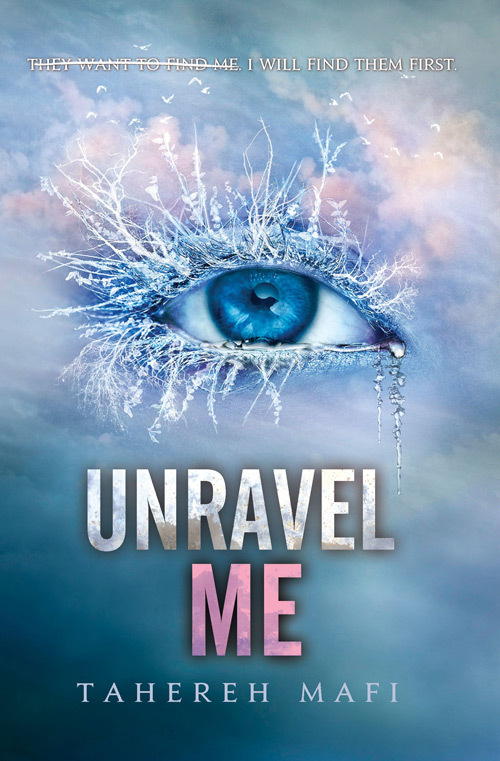 If you didn't win a hardcover of UNDER THE NEVER SKY, you should totally enter to win a copy of SHATTER ME. I'll finish out the summer with another great giveaway in August, so please keep checking back for new and great book reviews, writerly blog posts, and giveaways. Let's celebrate!! I'm not entering since I have this book already, but I wanted to say Happy Birthday! Enjoy! Thank you, Kelly, that's very kind of you. I see it's 6 months until TOUCH OF DEATH is officially published. I am looking forward to this book for sure! Happy birthday!! I haven't read this one yet, but have been looking forward to it. Heard so many great things. Last unputdownable book I read was My Life Next Door. Thank you, Jessie! My wife and I fought over reading this at the same time. I won of course. It was worth it. Thanks for the suggestion. Good luck! the last book I couldn't put down was Masque of Red Death by Bethany Grffin!!! 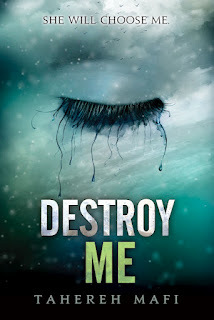 I have read Shatter Me and I really enjoyed it but I do have to say that I like the new cover better!!! I haven't read Masque of the Red Death yet, but it's definitely on my TBR. I dig the new covers, too. Good Luck! Good Luck! So, what book was your last unputdownable book? I've heard a lot about Fever, too. Definitely in the TBR pile. Good Luck! I so want this book. I hope I win. Glad you're interested in SHATTER ME. What was your last unputdownable book? Good Luck. I'm going to say Hollywood Ever After by Sasha Summers. I read it recently and really enjoyed it. And yes, I didn't want to put it down. LOL To me it didn't feel like I was reading a book. It felt more like I was there with the characters, watching their lives play out. No, I have not read Shatter Me yet. I would love to, of course. What interests me if that Juliette's touch kills. I'm curious as to how that plays out in the story, particularly the romance aspect of the book. Although I'm late, I hope you had a fantastic birthday! And thank you for the chance to win Shatter Me. Thanks for the suggestion! :D Good luck! Last book i read was shatter me! But it was my friends copy and i would love to own it! Thank you to everyone who took part in this giveaway. Keep your eyes out for more just around the corner. Congratulations to Saira Jatoi for winning a hardcover copy of SHATTER ME by Tahereh Mafi. Enjoy! I'm late in visiting your blog and wish you a happy belated birthday. Thank you for bringing these books to my attention.